In 2017 we believed that Sevenoaks District Council’s plans to build a Garden Village which would swallow us up in the town had been defeated. But no – those plans are back! Swanley Village Residents Association has supported and continues to support planned and sympathetic development in and around the village. In the Draft Plan these include Forge Yard HO10, Swanley Village Nurseries HO357 and Wood Street, back of Cedar Lodge HO298. We oppose expansion at GT16. It is essential, whether you support these plans or oppose them, that you make your views known in writing: either online via the interactive map: www.sevenoaks.gov.uk/draftlocalplan; by email to planning.policy@sevenoaks.gov.uk; or by post to Planning Policy, Sevenoaks District Council, Argyle Road, Sevenoaks, TN13 1HG. Multiple people per household may comment and the Closing Date is Monday 10 September 2018. You must make it clear, using the site numbers, which site(s) you are commenting on. By all means go to the drop in session at Swanley Link on 29 August 2pm to 8pm, but do not trust that what you say will appear in the feedback from the event. It didn’t last time around! The Swanley Village Residents’ Association met Tuesday 21 June 2016 for an initial discussion of the implications of development or change of use for the sites within the ambit of the village. We agreed to consult with Swanley Village residents and elicit their views prior to submission of this response. The letter, a copy of which is attached, was distributed to all villagers by hand and was also posted on the SwanleyVillage.com website. The Residents’ Association met again Monday 15 August 2016 and agreed that I should write to you at an early stage in order that the views of villagers are considered as part of the Green Belt and development assessment. 1) There was broad support for appropriate and some affordable housing development in the village. Sympathetic small housing developments in Hotham Close (25 units), The Staples (5 units) and Hogs Orchard (5 units) built nearly 20 years ago, are considered to have had a positive impact on the village. Only one letter objected to any further growth of the village. 2) Swanley Village is considered to have its own identity and character which is very much defined by the green space which surrounds it and the Conservation Area at its centre. All the roads that enter the village are single track at some point: Highlands Hill, School Lane, Beechenlea Lane, Button Street and Ship Lane. 3) To broaden any of the roads into the village would generate an increase in through-traffic using roads as a ‘rat run’ to avoid congestion on M25 and in Swanley. This would make the roads more dangerous (and less accessible) for pedestrians. It would also increase parking on narrow pavements in the Conservation Area, increasing the isolation of elderly or disabled Villagers, unable to risk walking in the road. 4) None of the roads has pavement for more than a short stretch which means that the network of footpaths across fields and open spaces are an important aspect of village life. The footpaths enable villagers to access the conurbations of Hextable and Swanley safely. They are therefore not just recreational, but practical, safe, pedestrian routes to shops, services and public transport (none of which enters Swanley Village). 5) Much of the Green Belt in and surrounding the village has been actively farmed over many years by a number of local families. In recent years Watts Farms (one of the biggest growers and distributors of fresh salad vegetables in the South East) has established itself at the Farningham end of Button Street and farms much of the surrounding land. There is local demand for all good agricultural land. Thank you for taking the time to read and consider the views in this letter. You are most likely aware that there is a shortage of new housing in this country and that the government has been encouraging local councils to free up land where developers can build new houses. Sevenoaks District Council has to increase significantly the number of units it builds to 3,000 over the next ten years. In order to achieve this SDC has asked landowners to put forward land they believe is suitable for development and has now started the process of assessing the merits of the land which has been offered. 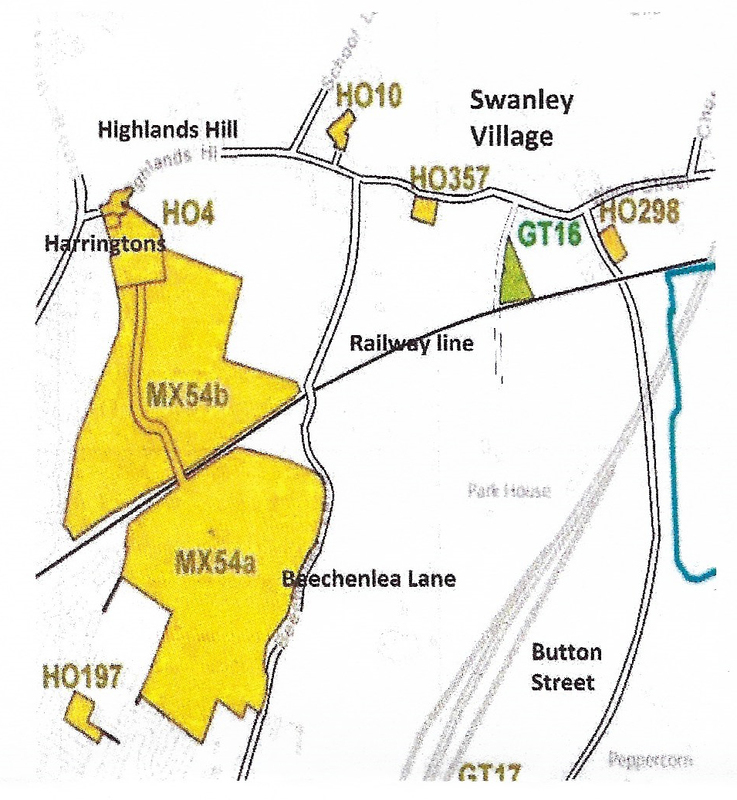 The Residents’ Association became aware that a number of these sites are in and around Swanley Village and Cllr Tony Searles kindly attended a meeting 21 June to explain what is happening. The list of potential sites across the district has been published online on the www.sevenoaks.gov.uk website under: Planning Advisory Committee Tuesday, 21st June, 2016 7.00 pm. You can also follow this link to a list of proposed sites: http://cds.sevenoaks.gov.uk/mgAi.aspx?ID=7328#mgDocuments (yes I wish it were simpler too!). The local context of this is that development and regeneration in Swanley town centre is at a more advanced stage and that U&I is soon likely to submit plans for over 500 apartment units, plus car parking and a hotel, with upgrading of the station now it is in the Oyster zone. This will make a significant contribution to SDC’s target, but we should expect some development in our vicinity too. None of these proposals is anywhere near the stage of submitting a ‘planning application’ but the Residents’ Association would like to hear your views about the prospect of residential building in these areas. It is the broader issues of regeneration and opportunity for local housing as well as encroachment on Green Belt, encroachment on a Conservation Area, merging of one town into another, preservation of the historic character of a place that we’d like to hear about. It is too early to discuss access, schools, services etc. The Residents’ Association will write to SDC Planning and would like to reflect the full spectrum of opinions in the village. You are also welcome to make your views known directly to the contact address on SDC website. Please email your comments to me at SwanleyVillageRA@outlook.com and include your name and address. I will not publish your details but need to verify that you are from the village. If you prefer to write please drop your letter through my door at 5 Hogs Orchard.